Our #ResNetSLT workshop on 12th May attracted a packed room of approximately 60 delegates from many different countries. The show of hands indicated a high number of student SLTs (#SLT2B) in the audience, together with educators, clinical practitioners and researchers. Please click here to access a copy of the presentation slides that include links for other relevant resources and recommendations for many names to follow on Twitter. We briefly explained how the #ResNetSLT Twitter journal club runs, and that a German version has been launched. 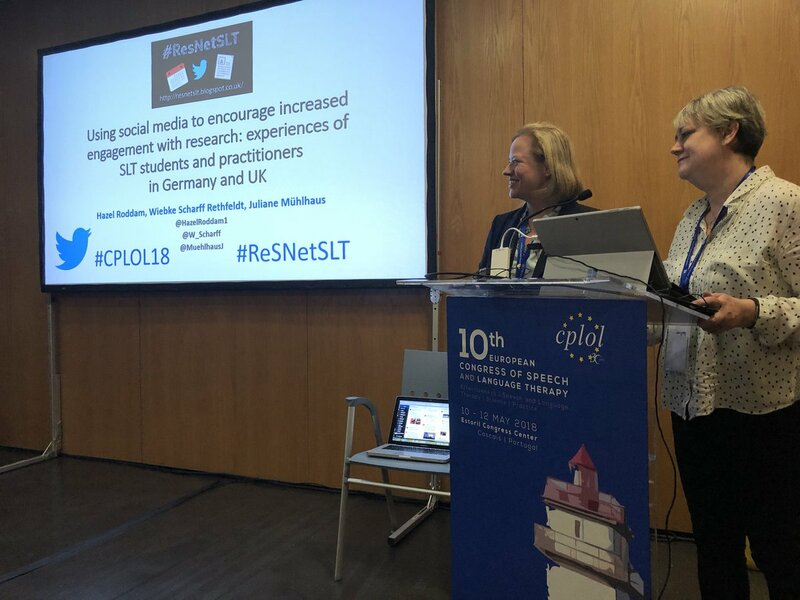 We heard about plans for a new journal club on Twitter between Netherlands and Sweden, and #ResNetSLT offered some advice and assistance based on our experience over the past two years. It was great to hear that SLT students and practitioners are increasingly using Twitter in many languages to share research and professional discussions – as well as other social media platforms. For anyone interested in getting started on Twitter for the first time, or for helpful hints on making the most of using Twitter to network with professional colleagues, we highly recommend the WeCommunities site. Thanks to everyone who attended this workshop – we collected lots of new Twitter names and will add them to our contacts list on this blogsite very soon. You'll also want to look at the slides from the oral paper presented by Professor Bronwyn Hemsley and Dr Hazel Roddam on 11th May - 'Using Twitter to Find Credible Sources and Build Research Communities: the #ResnetSLT Community'. Many thanks to Bronwyn (@BronwynHemsley) for working with us on this analysis – and for her ongoing support to #ReSNetSLT.